An interesting screenshot was found on the internet today. 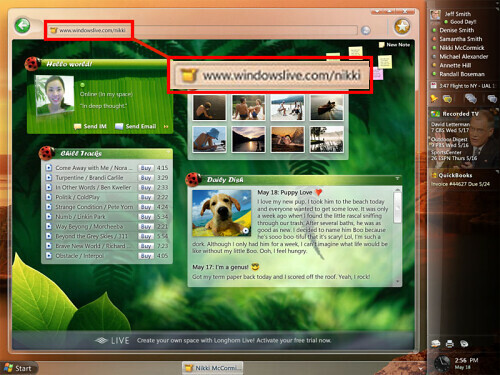 The screenshot depicting a concept art of Windows Longhorn running with an application called "Windows LIVE" - live "blogging" under Longhorn, a new feature that might be included in future OS releases. If you look at the bottom of the current window running, you'll notice two things - "Live" and "Space". A few days ago, Microsoft CodeName Wave was announced to the general public, a concept of integrating MSN, Hotmail, MOOL (Microsoft Office Outlook Live) and additional features. Wave, might be called "Live" in the near future. The word "Space" confirms that MSN Space, the newly released service offered for free, will indeed become part of the Microsoft "Live" or Wave service. Another interesting that should be pointed out, "Activate your free trial now". This might mean that Microsoft MSN Spaces or MSN "Live" might become a premium service and that a trial feature will be included.The concept was done probably in the first quarter of this year, just before the WinHEC conference. Remember this is just concept and it doesn't reflect on the final release of the service or product. However, expect these services to be smoothly ran on Windows Longhorn, in 2006. 그야말로 '살아 있는' 정보들을 간단하게 사용할 수 있는.. Windows Live 프로젝트가 완성된다면 윈도의 많은 것이 웹 기반으로 통합될 것 같네요. 사진속(왼쪽 상단 '여자사진')에 있는 것은 어떤 프로그램인가요? 덧. 그건 그렇고 비스타가 빨리 나왔으면 좋겠네요..마음에 안드니 뭐니 해도.. 역시 궁금함이...!! !